From ABC15.com (posted 13th march,2008) for original post see here ; the full article is posted below. “It’s been over a decade since thousands of Valley residents reported a strange grouping of lights in the Arizona night sky. 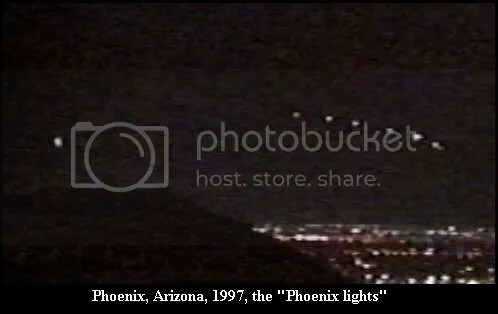 Thursday marks the 11th anniversary of the “Phoenix Lights”. It’s a phenomena that continues to draw questions from people around the world. The lights of different descriptions were seen on the night of March 13th, 1997. Some said they saw a triangular formation pass over their homes. Others saw a series of stationary lights in a long line. The United States Air Force later identified the lights as flares from the Barry Goldwater Range, but many continue to believe differently. Even former Arizona Governor Fife Symington reported seeing the lights, describing his encounter as a huge carpenter-square object moving over Phoenix. We’ll share some of your stories Thursday morning starting at 5 a.m. on ABC15 Daybreak. We’ll then look back at the Phoenix Lights, and try to answer some unexplained questions, Thursday at 10 p.m. on ABC15 News”.